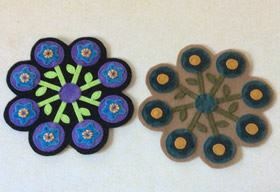 Join us for a weekend of Wool Appliqué at scenic Natural Bridge State Resort Park! Ann Reed will teach us a project that she designed for the retreat and you may choose from two colorways. All levels are welcome. If you are a beginner, come learn the basics of wool appliqué. If you are an intermediate, join us to discover what you may not know already and if you are an expert, well, join us for the fun and the view! Fees include lodging and teaching fees only. Meals and class kits will be additional costs. Kit prices will be $20 payable at the retreat. Orders will be taken after registration. Please register and pay your $25 deposit online at www.khqs.org. If you prefer to mail your registration, please send a request for printed application to fcstokes@gmail.com. Please note that the $25 deposit is non-refundable, except if you are on a waiting list and fail to get in. The balance of $125 for a shared room or $210 for a single room will be due by January 31, 2019. No refunds will be given after that date. For more information, contact Frances Stokes at fcstokes@gmail.com or 859-494-6515. You must be a KHAS member to attend the retreat.